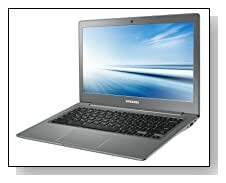 Samsung Chromebook 2 is a 13.3 inch compact- slim and lightweight notebook with a premium modern design, a fast and powerful Exynos 5 Octa processor for mainly web based tasks- not your familiar PC applications, very fast Wi-Fi, 8.5 hour battery life, fast 10 second boot-ups, full HD display and more at a competitive price..
Samsung Exynos 5 Octa 5800 (2 MB cache) processor at 2.1 GHz speed, 4 GB DDR3L SDRAM memory, 16 GB Solid-State Drive (eMMC Flash Drive), Chrome operating system.. Chromebooks don't have large hard drives so that they can be light and slim, what you do with your files is to store them on your cloud based Google Drive and access them wherever you have internet access or simply store some of them in your SSD which also makes sure that the system runs smoothly overall and boots up in 10 seconds and wakes up from hibernation in 1 second. The Exynos 5 Octa processor wouldn't be familiar to most customers, but it sure is a fast and powerful one that will significantly reduce the time it takes to do the usual tasks, especially for what it is designed and to work with the Chromebook OS. 4 GB system memory is quite a bit for being able to run a few tasks at the same time and you won't see any lags or freezing. 1 year premium service of AirDroid and Wunderlist is worth a mention too: Airdroid lets you access your Android devices from your Chromebook screen to send texts, make calls and have access to the Android apps, while the Wunderlist software allows you to control and share to-do-lists in real time. The 13.3-inch low reflection 250nit Full HD LED-1920x1080 pixel maximum screen resolution display offers superbly clear and sharp pictures with vibrant colors. It even has the image enhancer technology you will see in Samsung HDTVs- mDNIe, for brighter and more realistic images whatever you're doing on the Chromebook 2. Sound quality is quite good for something this small and lightweight, through its two high-power speakers and with noise reduction function. 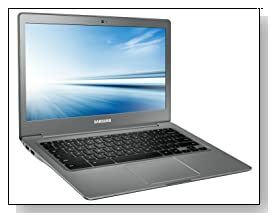 Samsung Chromebook 2 is only 0.65 inch thin and weighs just over 3 lbs. (slimmer and lighter than the competition) so it is extremely portable and comfortable too, with its textured faux leather cover similar to what you'd find in Galaxy Note 3. Up to 8.5 hour battery life means you can use your Chromebook out and about all day long on a single charge. You have a more comfortable keyboard than the previous Chromebooks, it is actually the same design as the Ativ Book 9 2014's keyboard. Some of its connectivity options include a faster than normal 802.11 A/C Wireless, 1 x USB 2.0 port, 1 x USB 3.O port, 1 x Audio-out port, an HDMI port, a microSD reader, combo microphone/headphone jack, DC jack, 720p camera and dual-array mics for a smooth live chat or video conferencing. Conclusion: You won't have to worry about viruses on a Chromebook 2 as it has the integrated security to functions to protect you from malware, along with a sandboxing concept to keep your applications and operating system separate so that they don't get infected from each other. You have the auto updates for the Chrome operating system whenever something new comes out, so it is nothing like Windows in that sense. Brilliant LED Full HD screen and the powerful Exynos 5 Octa 5800 processor along with 4 GB RAM, 16 GB SSD and a good variety of connectivity options on such a small package, at an affordable price..